An artist’s depiction of a tower that would be part of the Hub On Causeway complex and potentially house Verizon offices. Another week, another major company planning a significant expansion in Boston. Verizon is negotiating a lease that could bring hundreds of digital media jobs to the city and spark construction of a 24-story office tower atop North Station, according to people in the real estate industry with knowledge of the plans. 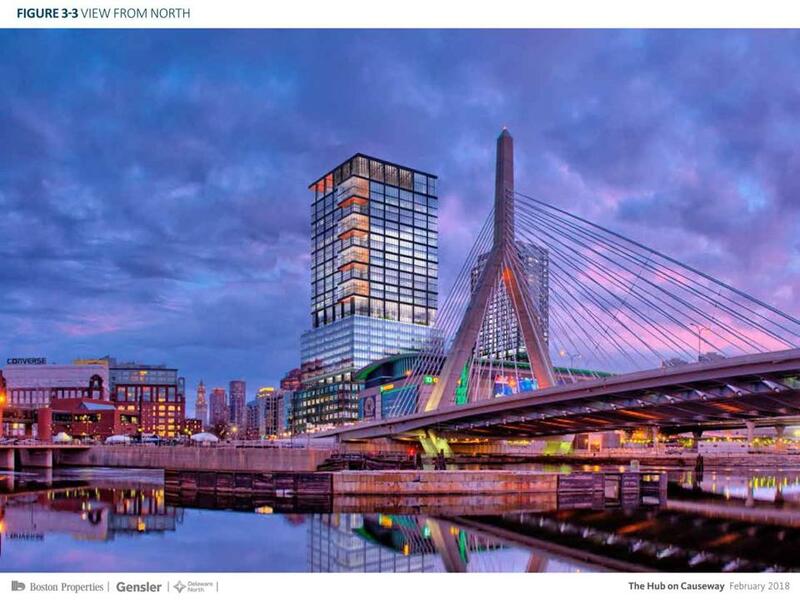 The telecommunications giant and Boston Properties, which is developing the tower as part of its The Hub on Causeway project next to TD Garden, declined to comment. But the people familiar with the deal said Verizon is considering a lease for at least 300,000 square feet, enough to house hundreds — or even thousands — of employees of its Oath digital-publishing subsidiary. The potential deal was first reported by the real estate trade publication Banker & Tradesman. Should Verizon move forward, it would be the latest in a string of huge companies — most of them tech-focused— to expand in Boston and Cambridge in recent months. Akamai Technologies is at work on a 19-story headquarters in Kendall Square, while Philips recently announced plans for a 2,000-person office at the nearby Cambridge Crossing development. Online retailer Wayfair and fantasy sports site DraftKings are planning expansions in the Back Bay. And just last week, Amazon signaled it plans to add as many as 4,000 workers in two new buildings in the Seaport District — even as it continues to study Boston as a potential site for its so-called second headquarters. The trend reflects a shift in Boston’s economy and office market, said Bob Richards, executive vice chairman at Cushman & Wakefield, a real estate firm. Companies eager to tap the city’s talented tech workforce are joining — and, in some cases, overtaking — financial services companies and law firms as tenants in prime office space. And they’re coming to neighborhoods not typically known as office hubs, such as the Bulfinch Triangle area near North Station. That’s where Boston Properties — owner of the Prudential Center and one of the nation’s largest office developers — is building The Hub on Causeway, a 1.9-million-square-foot complex of housing, retail, and office space on the site of the old Boston Garden. The first piece of the project, a mid-rise building with a supermarket, movie theater, and 175,000 square feet of office space, is on track to open later this year. Most of the office space has already been leased to Rapid7, a cybersecurity firm that will combine two operations — in the Financial District and Kendall Square — to create a new corporate headquarters. Work also has begun on a 440-unit apartment tower, set to open in 2019. In late January, Boston Properties’ president, Doug Linde, told analysts on an earnings call that the company was in discussions with another The Hub on Causeway tenant, for the office tower. “Demand for space in Boston from growing technology tenants is as strong as we have ever seen it,” Linde said. Last week, Boston Properties filed revised plans for the tower, which was approved in 2013, with the Boston Planning & Development Agency. It seeks to make the building taller, at 495 feet, while trimming the overall amount of office space and making a variety of tweaks to “respond to a new generation of office companies and their workforces.” The BPDA is scheduled to begin a design review Tuesday night. Verizon spokesmen declined to comment, other than saying the company is “always exploring new opportunities.” But people familiar with Verizon’s search for space say it has been looking for a large new Boston office for Oath and is close to signing a deal at North Station. Oath is the newly formed combination of AOL and Yahoo, which Verizon purchased last year, and aims to compete with Google and Facebook for online ad dollars. Oath currently has three offices in Boston and Burlington but would probably be adding a significant number of jobs in the city were it to lease 300,000 square feet, which could be enough room for 2,000 employees. Companywide, Verizon currently has 963 employees in Greater Boston, a spokesman said. The deal would also probably be enough to start construction on one of the biggest new office towers of Boston’s current development boom, in a highly visible spot near the Zakim Bridge. Like many other developers, Boston Properties typically does not launch construction until an office building is largely pre-leased. A lease for 300,000 square feet would fill nearly half the planned 651,000-square-foot tower. It’s a large enough lease, in a crowded-enough market, that Verizon probably had to opt for new construction, said Aaron Jodka, research director at the real estate firm Colliers International. That tends to be more expensive, he said, but lets the company build what it wants.